Animals are unquestionably adorable, but there are a lot of cute animal behaviors that are bad. Just because an animal is doing something that looks pleasant to you, doesn't mean that it actually is. Animal distress signals can include everything from dogs pressing their heads against the wall to elephants appearing to "dance." Sometimes, a seemingly sweet behavior is even a sign that an animal is about to attack. If you think your cat is wagging its tail because it's just so happy to see you, you couldn't be more wrong. Learn about all these allegedly cute animal behaviors so that you'll be better equipped to keep your pets - and yourself - healthy and safe. You may have already come across this video, or one like it, where an elephant is swaying from side to side as if it's dancing. 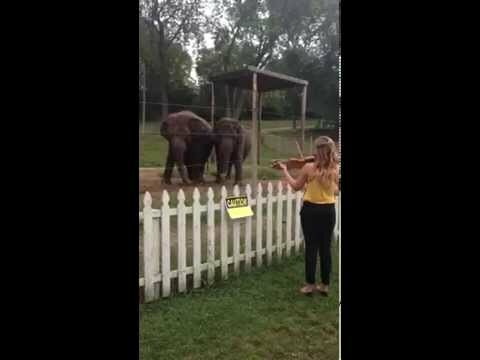 Sometimes, elephants do this when they hear music, and sometimes they do it seemingly unprompted. Is the elephant just expressing itself creatively? Unfortunately, as awesome as the idea of a dancing elephant is, there's a good chance that what they're doing is actually stereotypical behavior, which is a whole lot more depressing. This motion, called weaving by elephant experts, usually occurs as a result of the psychological impact of captivity. Elephants who are bored and unstimulated, or who are lonely and deprived of contact with other elephants, will weave incessantly. While the act itself is unlikely to cause physical harm, it's a huge indicator that the elephant is not doing well psychologically. We humans tend to yawn when we're tired, or when we're just not getting enough oxygen. And while dogs can yawn for those same reasons, it often means something else entirely. Dogs often yawn when they're stressed out or nervous. For example, if you and your dog are playing a game, and your dog isn't enjoying it anymore, they might yawn to try to give themselves a break or calm down. Dogs also sometimes yawn out of nervousness or fear, such as when they know they're going to see the vet. If you notice that your dog is yawning a lot, try changing something about their environment, or your expectations of them. If that's impossible, such as when at the vet, give them lots of love - or even just give them some space. When a cat rolls over and shows you its fluffy tummy, it's just about one of the most adorable things ever. It's easy to assume that this behavior means they're asking for a belly rub, but this is often not the case. Cats show their bellies as a sign of trust, but petting them there is actually a betrayal of that trust. Usually, what they're looking for is a pat on the head. So, if you do pet a cat who has shown you their belly, you can expect to be bitten, kicked, or scratched in return. Have you ever seen a dog pressing its head against a wall or other surface? This strange behavior might seem endearing, but if you catch your dog doing it, you should take them to the vet as soon as possible. Head pressing can indicate a number of different medical issues including a damaged nervous system, metabolic disorders, prosencephalon disease, tumors, infections, lead poisoning, and head trauma. While head pressing can appear as a standalone symptom, it may be accompanied by other issues, which vary wildly depending on the cause.